For the second straight year, Notre Dame faces Texas A&M in the Sweet Sixteen. A year ago, the Irish fell behind by seven points at the end of the first quarter, then outscored the Aggies 49 to 37 over the middle two quarters to take a five-point lead into the fourth. 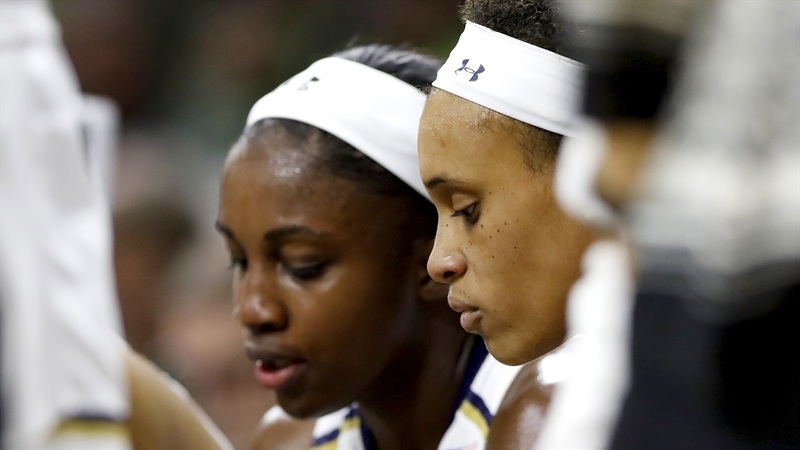 ND won by six in Spokane, 90 to 84, to advance to the next round. This is not the same A&M team that the Irish faced a year ago. Two junior starters transferred in the postseason. Anriel Howard, who scored 26 points and grabbed 14 rebounds in last year’s game, played this season at Mississippi State. Starting guard, Danni Williams, who averaged 14.2 points per game for the Aggies last season, transferred to Texas. The Aggies are still led by Chennedy Carter, who dropped 31 on the Irish in Spokane. However, she only made 10 of her 25 shots, was 3 for 7 from three, and just 8 for 13 from the line. This season, Carter has averaged a team-leading 22.9 points per game. She makes 40.4% of her field goal attempts, and connects on 33.3% from three, and 71.4% from the line. Her 51 made threes are just over 40% of the team’s total makes. As a team, the Aggies only average 3.8 made threes per game. A&M is not a high scoring team. The Aggies average 69.5 points per game — 88th in the NCAA. They connect on 43.5% of their field goal attempts, 33.3% from behind the arc, and 70% from the line. A&M limits opponents to 59.5 points per game — 59th in the nation. They average 12.7 assists vs. 14.7 turnovers for an assist to turnover ratio of 0.9. The Aggies are not a particularly aggressive defense. They average 6.1 steals per game and only force 14.2 opponent turnovers. Texas A&M starters play extensive minutes. In the down to the wire win against Marquette in the second round, four starters played all 40 minutes and the fifth played 39. The starters average between 31 and 35 minutes a game, led by Carter’s 35.0. Only two other starters average in double figures. Kayla Wells, a 6’0” sophomore guard, averages 15.0 points and 3.4 rebounds per game. She averages 47.3% from the field and 38.9% from three. Her 42 made threes are second on the team behind Carter. Statistically, she’s the team’s best three-point and free throw shooter among the starting five. She converts 80.6% of her free throw attempts. Ciera Johnson sat out last year after transferring from Louisville. The 6’4” redshirt sophomore center averaged 12.1 points and 8.2 rebounds per game. Her 32 blocks lead the team. Like Carter, Johnson was a McDonald’s All American. She shoots 52.8% from the field. N’dea Jones, a 6’2” sophomore forward, chips in with 7.7 points and 11.4 rebounds per game. She only makes 57% of her free throw attempts. She’s blocked 31 shots for the season. Shambria Washington, a 5’7” transfer guard, is averaging 4.8 points and 3.5 assists per game. She’s not an efficient shooter — 33.3% from the field, 28.6% from three and 63.5% from the line. She leads the team in assists and her assist to turnover ratio is 1.4. Washington did hit a game-winning three-pointer with 22.9 seconds left in the last game against Marquette. Texas A&M entered the NCAA tournament with a 24 and 7 record. They only played one top ten team all year and lost at home by 28 points to Mississippi State. A&M and the Irish have played three common opponents. The Aggies lost to Syracuse by 10. The Irish played the Orange twice and won by 30 and 25. A&M beat Oregon State by 6 in an early-season tournament. The Irish beat OSU by 10 in the Vancouver Showcase in November. A&M won in the final seconds against Marquette, while the Irish hammered the Golden Eagles by 24 in Milwaukee. The NCAA Selection Committee didn’t do the Irish any favors by placing Stanford as the two seed in the Chicago regional. The Cardinal is rated the fourth best team in the nation in both the RPI and Power ratings behind Notre Dame, Baylor and Louisville. Jackie Young is being more aggressive on offense lately. She averaged 9.7 shots per game during the regular season, but has stepped that up to 13.2 in the five post-season games. During the regular season, her highest shot total was 15, and she did that only twice against Drake and at home vs. Louisville. She took 18 shots against the Cardinals in the ACC Tournament championship game. After averaging 14.3 points per game in the regular season, she’s up to 18.0 points since the ACC Tournament started. She’s started taking and making more three-point shots recently. Through the first 29 games of the regular season, she only took 20 three-point attempts and made six (30%). In closing out the regular season at home, she hit 3 of 4 from beyond the arc against Virginia. Including that game, she’s made 7 of 9 from three (77.8%) over the past six games. She’s also made 80% of her free throws in the postseason. Her rebounds per game are up to 9 from 7 in the regular season, and her assists per game are at 5.8 in the five post-season games vs. 5.2 in the regular season. Both Brianna Turner and Jess Shepard have worked on improving their free throw shooting. Turner made 61.2% of her free throws her first three years. From the start of the season through the loss at Miami, she improved slightly to 64.3%. The last eleven games, she’s hit 75.5% of her free throws and her shooting from the line has improved to 85% over the five post-season games. Her average across the full season is now up to 68%. Shepard had a similar improvement, which was noticeable from the start of ACC play. A 60.2% free throw shooter through her junior season, her senior year average is now up to 71.3%. After only connecting on 24 of 42 attempts (57.1%) before ACC play started, she has converted 68 of 87 (78.2%) since the first ACC game against Pittsburgh. Both players are shooting well from the field in the post-season. Turner is at 72.5% over the past five games. Shepard is making 63.8% of her field goal attempts. Both have also increased the scoring output in the post-season. Turner averaged 14.5 points and 7.7 rebounds per game in the 30 regular season games — she’s up to 18.2 points and 8.4 rebounds in the five post-season games. Shepard was at 16.7 points and 10.0 rebounds during the season. She’s averaged 20.2 points and 10.6 rebounds since the start of the ACC Tournament. Turner broke Ruth Riley’s career rebound record of 1,007 during the game against the Spartans. She now stands at 1,010 and counting. Her four blocks against MSU have moved her eleven short of Riley’s career record of 370. Turner is primed to become the third two thousand point scorer in ND’s lineup — she’s now just 36 points short of that goal. Arike Ogunbowale passed 2,500 career points against Michigan State. She’s now at 2,517 points for her career. Shepard has now scored 2,274 points combined at Nebraska and Notre Dame. She’s also collected 1,197 rebounds. Monday’s 91 point effort against Michigan State boosted ND’s NCAA leading scoring average to 89.2 points per game. Saturday’s game is scheduled to tip-off at 4 pm eastern (3 pm in Chicago). The game will be televised on ESPN2. In-game updates will be posted below.